Home Health How Does Your Car Affect Your Health? How Does Your Car Affect Your Health? Just because you spend so much time in your car, doesn’t necessarily mean you think about it having a relationship with your health. Unless you’re some sort of crazy enthusiast, driving probably just blends into the background as the thing that takes you to work every day. But a car can need AZ emissions testing – what you need to know and also end up having more impact on your health than you think. While your Honda may not sneak into your bedroom window to smother you with a pillow, it may be more serious that you think. Getting angry means that your heart rate increases, and when your heart rate increases from stress, it’s not the same as if you ran several miles. Your ticker is important when it comes to keeping you alive, and putting it under that kind of duress won’t help. Whether you must do breathing techniques, stay off the road during certain times of day or just simply close your eyes (oops, never mind, don’t close your eyes), you’re going to have to find a way to calm your blood pressure down some. Driving is inherently sedentary, and that’s not helping your body with everything it needs to do. Your body needs to move to get the circulation going, and long car trips don’t help. But we already know the excuses. You’re not going to carry back 15 pounds of groceries back from the store, you’re not going to go for a walk when it’s pitch black and there might be puppy kickers waiting for you, you’re not going to go out after you just spend an hour in the car. We get it. We know why you’re sitting and not exercising. That doesn’t mean it’s ok though. How old is your car? How old is that leather? How well was it made when it was brand new? 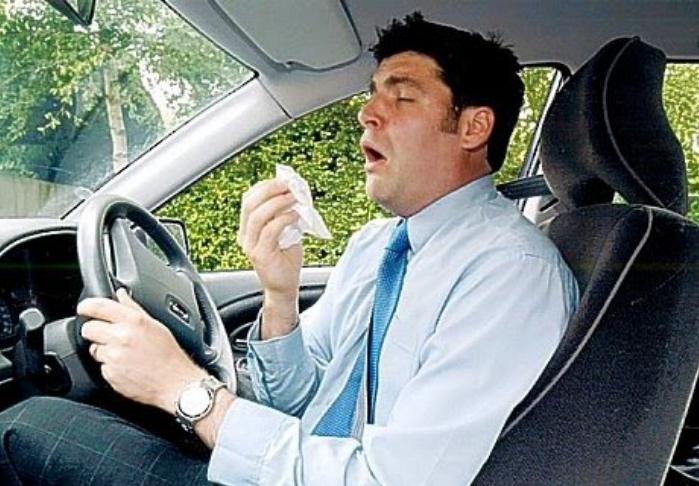 If your skin has been itchy where it makes contact with the seat, you may be having some type of adverse reaction to your car. Also, if you haven’t cleaned it for a while, there could be a variety of dust mites or dirt in the fibers that aren’t helping you have that natural glow. Even if there’s no visible rash, you may want to consider what you’re exposing your body to every time you get in the car. Reupholstering your car or even cleaning it may help tremendously. Carbon monoxide isn’t great for you, and while car manufacturers know this, it’s worth avoiding it as much as possible. Carbon tends to stay in your lungs, so the less of it you have, the better off you are. Air pollution is a major concern for our health, and the reason why you don’t hear about it as often as you should, is that there really isn’t much we can do about it right now. Driving is a necessity in our world today, so the best we can do is reduce our amount of time on the road for the benefit of better breathing. Look, no one’s saying that your car is killing you. Plenty of people drive for decades and die in their sleep at the age of 100. But it is something to be aware of when you’re in your car and on the road. The more you pay attention to rules and tips from traffic school, your body is doing as you spend more time in the car, the more likely it is you’ll make better choices about what you do and how often you drive.